We interview a new guy in town who couldn’t decide if he wanted to go into politics or become a priest. So he became a priest and still is into politics. His take on the Pope and Catholicism in today’s America. 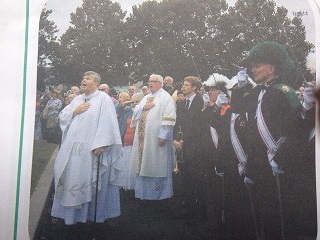 Father Tom Flowers Leads the National Anthem at his church’s 9-11 Memorial Mass. First, I am a parishioner at Father Tom’s church, let’s us be fair and balanced. Still and so, he is a fellow I’d be seeking an interview with for his reputation in Delaware as a vocal member of the clergy who speaks the truth. St. Jude the Apostle was all atwitter when we learned a new Pastor was coming, much like any religious congregation would be at such news. I prodded and poked fellow parishioners for a name. “Father Flowers” another parishioner let me in on the scoop. Right then and there I decided he had to be a bit of a goof, a throwback to the psychedelic 60’s. The first time I laid eyes upon Father Tom I looked at my choir mate in shock. “He’s a kid!” I said. Indeed from my perspective Father Tom looked to be in his late 30’s. In reality he is 64 years old, a Delaware native, something rare these days, has a degree in History, attended a Baltimore seminary, has been a priest for 38 years with St. Jude the Apostle being his fourth pastorate. Father Tom, at a young age, was torn between politics and religion. He chose religion but, it would seem, his fascination with politics never left him. Over the years he has served as a delegate for several Delaware State Republican conventions, worked for various electoral districts in Smyrna, home of his last pastorate. Below is a Youtube clip to a speech he gave at Delaware’s “Faith and Freedom” foundation that yon reader might get his speaking style. Speaking of…well speaking style, I have the perfect job for Father Tom Flowers, Besides being a priest, of course, which he does very well. My first experience with Father Tom and his world famous homilies, came at the church’s special 9-11 commemoration mass, something we’d never had before at St. Jude’s. At 8:46 am the congregants sat in silence in memory of when the first plane hit the World Trade center. The mass was normal with a ceremony afterwards honoring a new outdoor flag pole he installed on the church campus. It was Father Tom’s homily that day that had the congregation sitting in silence and awe. For he spoke of Islam, explaining, quietly but with that firm speaking style that will forever be his claim to fame, that the faith of Mohammed is a false faith, that Mohammed thought the holy trinity to be the Father, the Son and the Virgin Mary. The congregation sat silent as Father Flowers expounded on the trials of Christians in the Middle East, the sins of the radical Islamists, the dangers this false religion continues to bring to America. Indeed Father Tom is a patriotic man. “Showing love and respect for country is Catholic and it’s not done enough in our church,” Father Flowers explained. Over the course of the interview I learned that all kinds of things are Catholic: supporting freedom and justice, being a good citizen, love of the poor. THIS Catholic was surprised with these revelations but I knew, by the interview date, that Father Tom practiced what he preached. Father Flowers attended last week’s meeting of the Sussex GOP, an invitation that I extended to him as introduction to the local politicos. He wore a T-shirt….well I won’t go there but I wanted to slap him silly. He, of course, wanted to shock, intentionally but, to my shocked surprise, most of the attendees of that meeting knew Father Tom from prior political interactions upstate. As I stood on the side watching my Pastor greet attendees who lined up to shake his hand I was impressed. Every one of them, I noted, with a strange pride welling up within me, assumed a posture of respect and somber greetings. Even with that silly shirt he still had their awed attention and reverence! “Pope Francis and Donald Trump have a lot in common,” Father Tom told me. A comparison which sort of gave me pause. “They both speak their mind and people love that,” Father Tom continued on and I nodded affirmative at what might have, at first, seemed a strange analogy. Because for sure Pope Francis causes Catholics of various political extremes some grief at his words which often do not reflect a world view that Americans quite grasp. Like John 23, Pope from 1958-1963, Francis loves the poor and chooses a simple life, so Father Tom expounded on this eve of the Pope’s visit to America. We both are a bit excited by the Pope’s upcoming visit, because, come on, when’s the last time some important Lutheran cleric got such glorious attention from the world? Father Tom has plans to fill up the classrooms of St. Jude the Apostle, to have groups hosted on the church campus, such as Al-Anon, groups that bring a sense of hope and belonging to those enduring addictions by loved ones. “My father was an alcoholic,” Father Tom informs. He goes on to inform that having others around with like problems is one of the best ways to offer help to those in anguish. And so it would seem Father Tom very much likes to speak publicly. For I asked him if he would consider speaking in any other venue besides behind a podium on a Catholic church altar. Father Tom says he would speak at pretty much most venues if the topic was on a subject he was passionate about. In fact our own church is starting to fill up quite a bit with word of Father Tom’s clerical style becoming public knowledge. “We might have to schedule another Sunday mass,” Father Tom, says with a chuckle. Who knows what the future holds for Father Tom but I have the ideal venue for him. Imagine a priest hosting a talk radio show. Here in Sussex county we have not one, but TWO talk radios, proving that we are all bunch of nut jobs down here in the swamps of Delaware. For Father Tom loves to talk and he does it well. He doesn’t refer to notes when he does his homilies. He speaks from a chair at the altar rather than from a podium. And I don’t think Father Tom would be saying bad things about women on his talk radio show. NEXT : Got a post in pics coming up and more Delaware tidbits. Stay tuned. ← Democrat’s War On Small Business, And What’s Wrong In The 14TH?